If you combine a perfect beach block location with the added luxury of a large heated pool, here is your perfect choice for your vacation. This classic Avalon home has five bedrooms, one full bathroom, and two half bathrooms. The breezy and crisp seashore décor puts you in a beach state of mind from the moment you enter this home. The side entrance opens to the kitchen and dining room with seating for ten. There is a half bathroom and two bedrooms on the first floor. One bedroom has two sets of bunk beds and the other has a queen-size bed. A living room with a HDTV and a lovely enclosed porch that functions as a family room completes the first floor. Three additional bedrooms are located on the second floor. A master suite offers a king-size bed, a HDTV, and a half bathroom. Another bedroom has a queen-size bed and features access to a deck with a spectacular ocean view. Another set of bunk beds along with a single bed are in the fifth bedroom. Enjoy a large, lovely patio area that includes not only a heated pool, but also all you need for entertaining, including plenty of pool furniture, dining seating for eight persons, a wet bar that seats eight, a mini fridge, ice maker, a gas grill, and a shed with an additional refrigerator/freezer. An fully enclosed outside shower, washer and dryer, clothesline, and off-street parking for two cars are added conveniences that make this home the complete package. 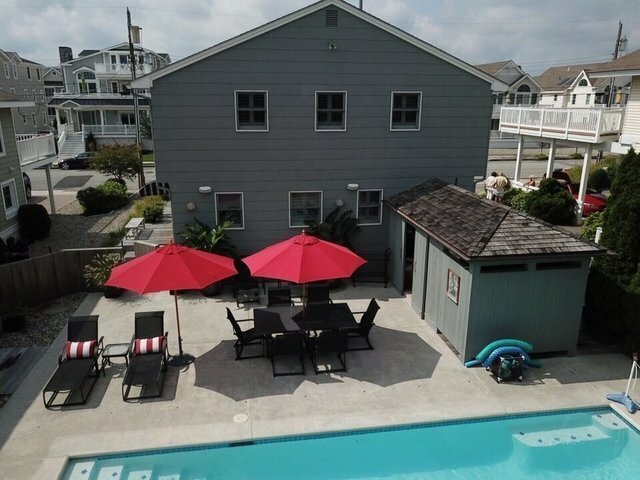 Located just two and a half blocks from Avalon’s downtown area with restaurants, shops, and entertainment.